Have you ever missed an important app review because it mixed up with tons of others? Or postponed your response because you couldn’t answer at once? All such delays may affect your app rating and customers’ loyalty. If you use Freshdesk to work with customers’ reviews, we know how to speed up your reply to reviews routine. 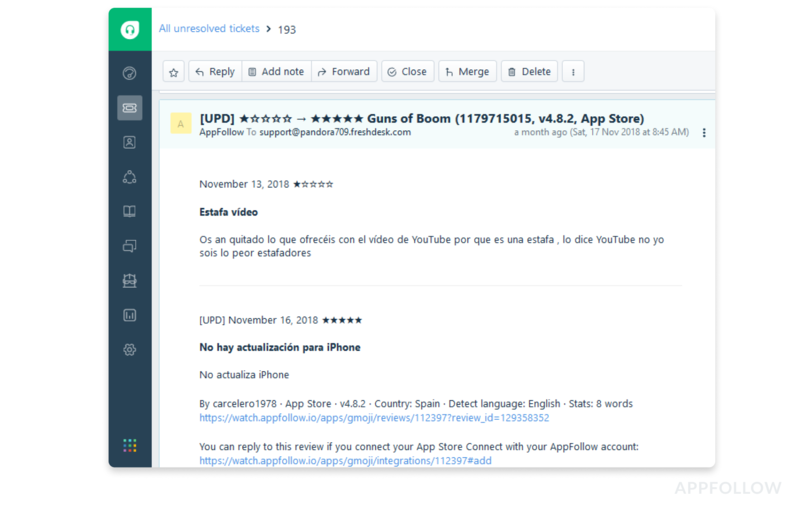 Apart from the review itself, a ticket contains the information about a user: country or language, app version, time stamp, and previous messages. 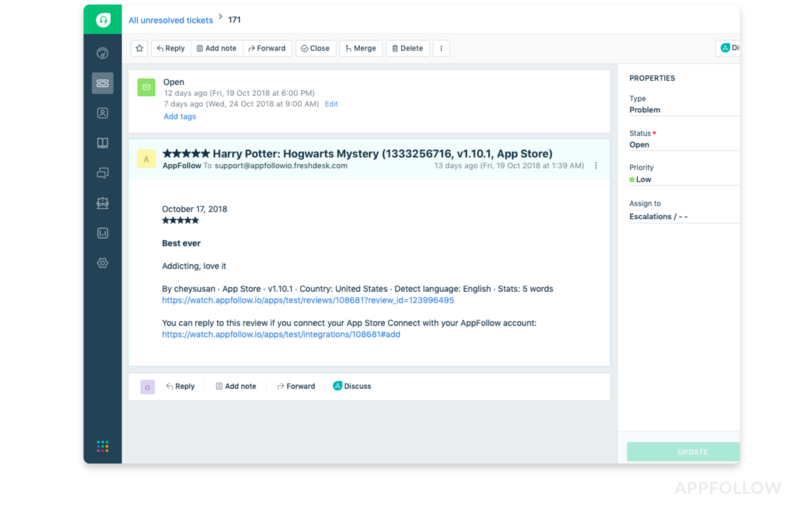 Level up your customer support using benefits of both platforms, AppFollow and Freshdesk. AppFollow will deliver all users’ reviews even faster than the app store would notify you directly. You have an option to customize what reviews to get: tick the number of stars and get all of them, positive, or negative ones. You can also assign tickets to your colleagues, and send your reply via email or right from your Freshdesk account — speed up your work with customers. You can harness all the features Freshdesk has to offer like : internal notes, tags, and reply templates to grasp a user’s problem even faster. 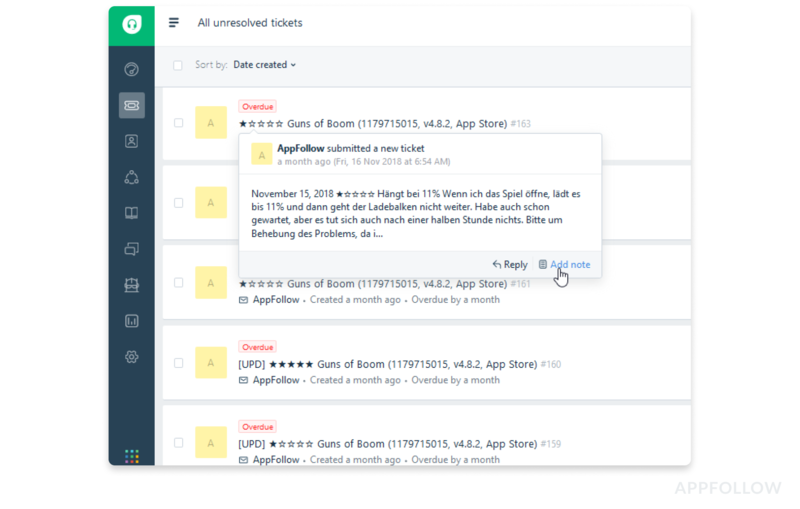 Use all benefits of Freshdesk, for instance, leave a help note about a tricky ticket to a colleague. Add more context to your replies: the Integration shows you a user’s previous complaints, so you can create a thoughtful reply. You will see customer history in the same ticket, and can cover the issue more thoroughly. Fast reaction leads to higher ratings and conversion rate. Here a user had sent a 1* review, but changed his mind after getting help from the customer support. All these actions lead to higher app’s rating and increase customers’ retention rate. Replying to reviews is not enough. Be better than that, monitor and constantly improve your team’s work. How delays influence app’s rating. It's the same way you'd see reporting on the ordinary tickets, but here you could track performance of the team and how they handle user reviews. It is simple to start getting reviews as tickets and send your response. 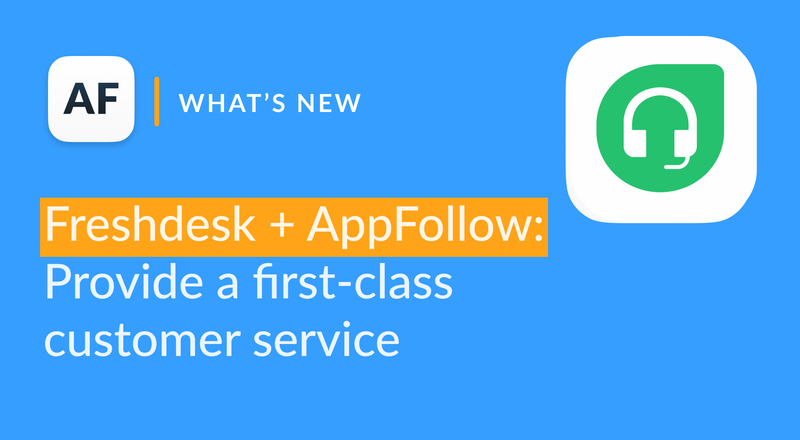 Use your Freshdesk email to connect the AppFollow account. Check our guide for a quick start. Get in touch with our customer success team, we’ll help you to connect all your team members, apps and products you need.